Below are examples of the typographic work developed at VCU through the Arabic Typography course I gave in 2004. This project, entitled graphics in the environment. The notion of “local Design” was the main field of investigation in the typography course. Through a variety of experimental assignments, the students were focused on creating typographic and graphic pieces that were a true reflection of their own visual environment: The Task was to simply see if it was possible to create a graphic design language that belongs to their own surrounding, a visual language that is unique to the location where the design work was produced, and that couldn’t be developed elsewhere. Students were asked to explore the rich environmental graphic language that surrounds them: Signs, neon letters, big Arabic and English Postings, wall graffiti’s… etc. They started by taking photos of a corner, a street, an angle that has a cluster of signs with a lot of bilingual typography, particularly Arabic [type, handwritten lettering, Calligraphy…]. The end result is a series of 8 pieces developed by every student, documenting the specific environment they chose. Below are some examples of the work developed by the students: The first example shown below is a complete series of 8 pieces developed by student Dana Ahdab. the first piece started with a collage of a specific corner that she decided to document, and she developed that collage graphically and typographically into further compositions, with focus on type, imagery and interesting graphics. All 8 compositions are show below; the last being made only out of type found in the images yet independent from the photos or the previous compositions. Note how interesting for example composition is; a balanced combination of imagery and type, giving a good feel of the street language of that specific area in Doha City. This student used the graphic style she created in this assignment later on in another corporate identity project she worked on. The work of another student in this same assignment is shown below. Only two pieces are displayed here, but these are excellent examples of complete and rich visual typographic compositions. 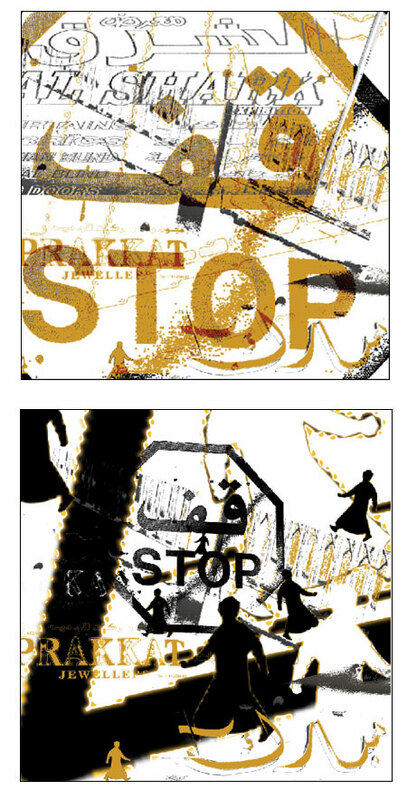 From her initial photography documentation / collage, she focused on the typical local pedestrian sign and developed it further using tat specific pedestrian signage graphics and typographic. A slight introduction of colors added more value to the interesting texture created in the compositions.